Skeletons get a bad rap, don't they? Like, it's one of your most vital organs in your body, it helps you stand upright, and it even protects the rest of your body from serious injuries! And we have the nerve to call them scary! It seems as though we owe it to skeletons to start giving them a better name. Perhaps you just need to promote all of the benefits of having a healthy skeleton. You could teach everyone the importance of getting enough calcium in their diet. Maybe you just need the right kind of accessory to help you promote the wonders of the skeleton! This Skeleton Lanyard is for anyone who enjoys skeletons! The ribbon has plenty of cartoon skeletons printed on each side. On the end of the lanyard rests a D-ring, which is perfect for carrying all of your important keys. You can also use it to carry around an ID badge if you just snap your own ID sleeve onto it! 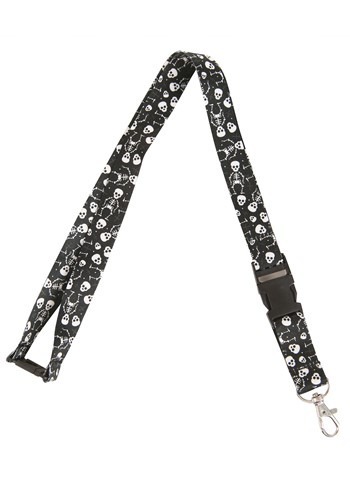 Of course, if you like skeletons because you think that they're a bit spooky and we can't sway your mind, then you can still put this lanyard to good use. Just remember to give skeletons a good name while you carry your keys around in this lanyard.